Perhaps you’re in the throes of acquiring a new business client. You’re looking forward to the shaking of hands, the signing of contracts and the celebrations that come afterwards. But before all this you have to seal the deal and choosing the right setting for negotiations can be difficult. 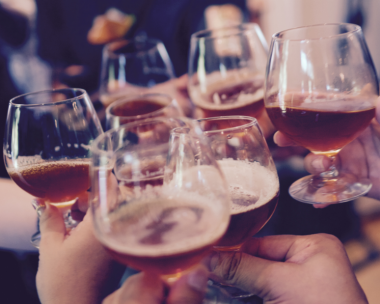 Here at IMC we have selected some of our favourite spots in South West London that are perfect for you and your client(s) to toast your impending successes. This elegant wine bar in Battersea has an industrial-inspired look that oozes rugged charm with cork-lined walls and wooden tables. Quirky, cool interiors aside this bar has an impressive organic wine selection. So, if your client is staunch vino connoisseur you can be confident in your choice of venue with The Humble Grape. Aimed at a slightly older crowd than the regulars on Clapham High Street, making it an excellent option for drinks with your professional peers. This individual bar is designed to look like a vintage record shop, so if your client is a vinyl aficionado then this could be the place for them. Bottled beers, pizzas, cocktails and a modest wine list make Venn Street Records a groovy alternative to stiff collared, stuffy bars. This wonderfully eccentric restaurant and cocktail bar alternative in Clapham Junction. Powder Keg Diplomacy offers a drinks list that will draw you into a bygone age influenced by Victorian imagination, ingenuity and innovation. The Observatory Dining Room boasts Victorian finishing’s and floating gramophones that have been reclaimed and repurposed into light fittings. The Powder Keg would make any client smile and the generous seasonal menu has something to tempt all palates. The Depot brasserie looks out onto the Thames giving this handsome, high-ceilinged Edwardian stableyard conversion charming in buckets. Robust, homely cooking by chef Gary Knowles makes this place an ideal location to wine and dine a potential client. Fresh, well sourced, homemade from scratch food that’ll leave you happily full. The Bluebird restaurant is a ‘local neighbourhood restaurant on a grand scale’. Certain to impress your client, this vibrant restaurant is located on Chelsea’s premier King’s Road making it easily accessible. The refreshingly modern contemporary interiors are complimented by an impressive wine list and a generous menu offering, including mouth-watering delicious small plates & sharing dishes, as well as sumptuous main courses. This understated, earthy setting for sophisticated Italian cuisine uses gutsy ingredients to tantalise the taste buds. BIBO is a modern restaurant in both its interiors and menu offerings. As winner of the Imbibe Italian Wine List of the Year, BIBO is another excellent choice if your client is an avid wine enthusiast. The enchanting yet relaxed atmosphere allows you and your client space to drop in for a drink, a quick bite or for a complete experience in dining.